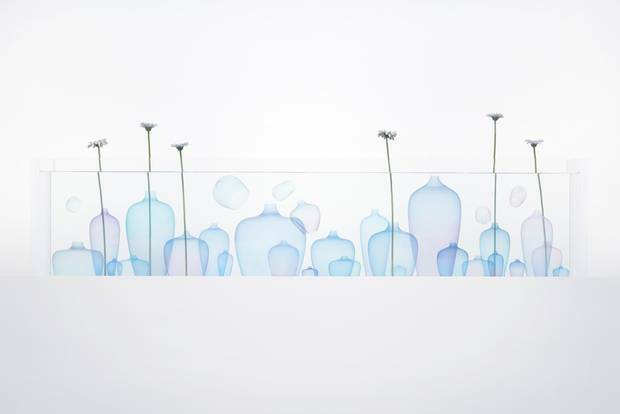 Nendo’s Jellyfish vases are made of silicone. "Have you seen Nendo yet?" The name was on everyone's lips throughout the week, so much so that it became an obsession for most to fill their itineraries with as many Nendo projects as possible. And there were many, including works for furniture brands Cappellini, Kartell, Moroso, watchmaker Panerai, and fashion house Jil Sander. "We have 60 to 80 objects for 14 or 15 companies," said Toronto-born, Tokyo-based company founder Oki Sato somewhat nonchalantly as he gave me a quick tour of his debut collection for lighting company Flos. Nendo's team of 25 designers churns out an astonishing amount of high-quality work every year. 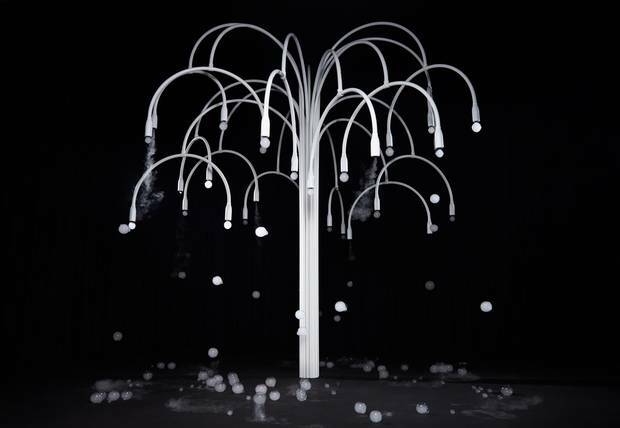 "But this one is only one designer and myself," Sato said of the Gaku lights. His debut for the lighting giant is unsurprisingly unconventional. "I didn't want to make a lamp," he said. "I wanted to make something in between furniture and light, and try and mix the functions together." The experiment resulted in a "room" for a lamp, complete with accessories including bowls, vases and bookends that are held in place by magnets. "It's very Japanese," he said, something that is inherent in the brand's DNA, but always with a twist. Before he was summoned by his handlers, I promise to check out the Invisible Outlines exhibition at the Jil Sander showroom before I head back to Toronto the next day. I arrive at the showroom in the Brera Design District only to be turned away due to high capacity. "We open at 9 a.m. tomorrow," said the woman at the door as she guarded the entrance. Not seeing this show would be like not having gone to Milan at all, so I woke up early, packed, Ubered to the venue, and saw the show at lightning speed. After passing by mannequins donning the Nendo x Jil Sander capsule collection, my anxiety was immediately soothed by 30 Jellyfish vases, malleable decorative containers submerged underwater. Their silicone skins undulated with the gentle waves – only delicate daisies popped above the edge of a large aquarium. It's that sort of twist that puts Nendo on everyone's must-see list. Metteo Cibic designed Mandala, a lotus-inspired cabinet, for Scarlet Splendour. There is no better way for a new brand to get noticed than to enlist Matteo Cibic to design pieces for its debut collection. Kolkata-based Scarlet Splendour launched during Salone del Mobile in 2015 with the help of the Italian designer whose unapologetically unique work can captivate even the most serious formalists. Form does not follow function for Cibic, but rather follows his imagination in whatever direction he decides to take it. 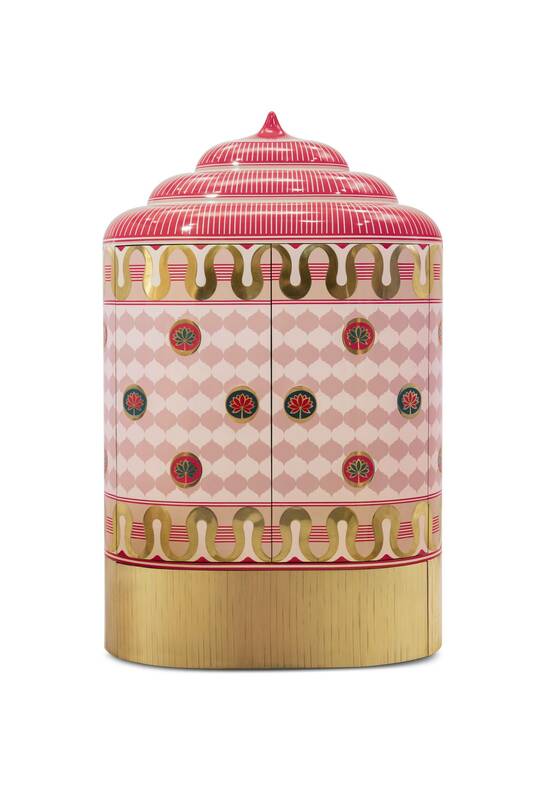 New pieces for Scarlet Splendour include Mandala, a lotus-inspired cabinet rendered in wonderfully kitschy pink and gold, and Fool's Gold, a collection of melty-looking gold furniture. The eclectic designer also drew quite the crowd to Foyer Gorani square where he exhibited a sample of the Vaso Naso collection for which he handcrafted a piece each day of the year, leaving many spectators feeling like underachievers. Formafantasma’s WireRing lamp contains an LED strip. 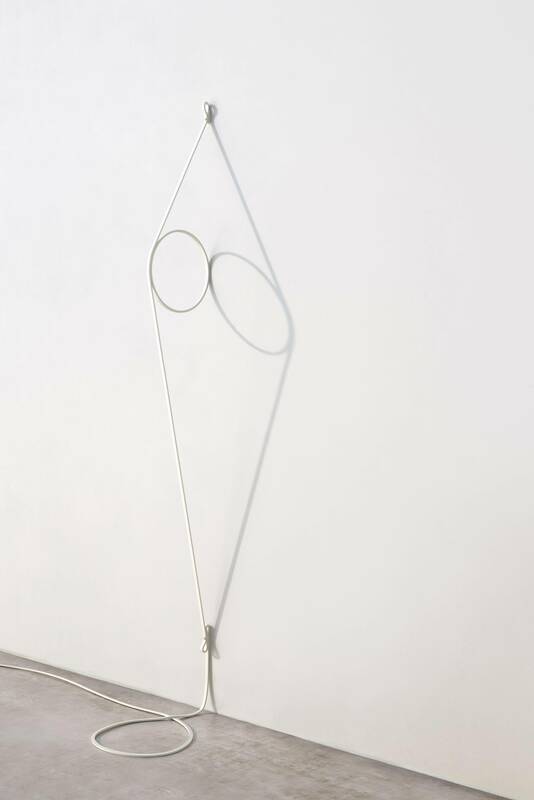 To mark their 10 th anniversary, Andrea Trimarchi and Simone Farresin, the Amsterdam-based Italian duo behind Formafantasma, filled the newly reopened Spazio Krizia with their minimalist brand of sculptural lights, some from their Delta collection for Giustini Stagetti, Galleria O. Roma and others of a purely experimental nature. The exhibition, titled Foundation, highlighted the studio's meticulous focus on the material as form, revealing things usually kept hidden, such as LED strips, which the designers left visible and unfiltered. The idea of bringing an object's guts to the forefront also extended to their first collaboration with lighting company Flos. Formafantasma's WireRing lamp is comprised entirely of a belt-like electric cable, forming a ring that contains a LED strip, reducing the object to its absolute minimum, while the Blush Lamp is comprised of two strips: a LED and a dichroic glass that casts reflections on the wall. Talk about maximizing minimalism. New Spring’s mist-filled bubbles is inspired by the cherry blossoms at the Sakura Festival of Japan. Attendees were handed black cotton gloves before entering the dark 1930s decommissioned Cinema Arti for a surreal experience of catching bubbles. Yes, bubbles. New Spring, an installation designed by Studio Swine (Super Wide Interdisciplinary New Explorers) in collaboration with Swedish clothing brand COS, took cues from the Sakura Festival of Japan, with the mist-filled bubbles standing in for falling cherry blossoms. The design duo Azusa Murakami and Alexander Groves dedicated their multi-sensory installation to new beginnings, starting fresh after a tumultuous year in world politics. It sounds awfully optimistic, but if anything can make one forget about Brexit and Trump – if just for a moment – it's the joy of being in a room full of people balancing precious bubbles in their hands while emitting sounds of delight. Nichetto’s Canal chairs evoke the shape of a traditional gondola. Milan was a homecoming for Venetian-born Luca Nichetto. Well, sort of. The prolific designer paid homage to his hometown with two separate collections. Almost two decades after his debut for heritage Murano-based glass maker Salviati, Nichetto reunited with the brand for Pyrae, an installation of 53 glass light totems at Ventura Centrale, an abandoned train tunnel near Milan's Central Station. The collection, designed as a set of 25 interchangeable base modules in 15 traditional Murano colours, filled the dark space like a galaxy of stars. Also playing on the Venetian vernacular, Nichetto's Canal chairs for Moooi evoke the shape of a traditional gondola, while the fabrics mimic the typical colour combinations of the iconic boats. They're nostalgia done right.